Yatango Mobile has built their brand as an innovative MVNO using the Optus network which allows you to tailor your mobile plan to your needs. Those needs are about to cost a little more though with Yatagno Mobile announcing new pricing that will become effective as of the 5th of May. Voice, SMS and Data will become more expensive across the board with Voice and SMS Packs getting a smallish increase to the current arrangement, but Data Packs are the main victims here, with a massive hike in price at the gigabyte end of the scale. Yatango is also including double credit when you invite friends who then join up to Yatango Mobile, offering $40 per referral instead of the usual $20. Cause who wouldn’t want to invite a friend to pay more than you used to? 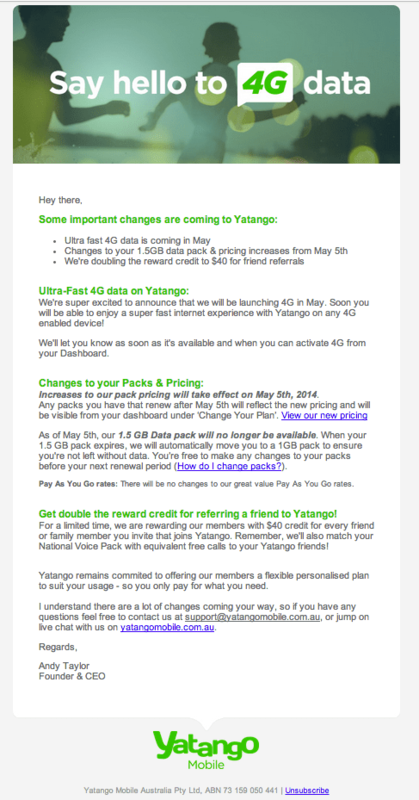 There’s also a bit of a bonus, with a rumour that Yatango is about to annouce 4G to coincide with these new plans. There’s no mention on the Yatango Mobile Blog of anything to do with 4G, but we’re assured that the announcement will be made in May. It’s an inevitable fact of life that carriers, and indeed MVNOs have to make a profit and there has been a shift across the board to charging more for services. It has mainly come from MVNOs who seem to be under pressure from their network providers, so don’t expect this to be the last, but at least the possibility of 4G connectivity will reduce the sting a bit! What about Virgin PrePaid Payrise? Has anyone had much to do with this? $30 for 1gb that rolls over if you recharge before expiry (up to 5gb) and $450 cap increasing by $50 for each recharge up to $600. They use Optus 4g so yeah …. any opinions or experiences? It sounds ok …. Exetel are bumping their $8 plan to $14.99 from 1st May. Switched to Yatango with no packs, ie. $0. Just pay for calls. I calculate that the 5 minutes or so of calls that my mother makes a month will cost around 75c. Even if it’s a couple of bucks .. better than $14.99. We’ll see how it goes… Free to port as well. Vaya? Dodgy metering apparently, but cheap. Is that screenshot meant to be of 2 phones? Any chance of getting a feature article comparing the different provides now they have all had price hikes? I would have hoped that as more people use mobile data prices would go down, as most other things do. @Jim same here, I went from Aldi –> Boost –> Yatango for the same reasons, price hike after they got the customers in…. surely this is illegal. And to hike the data by $9/$29/$59 is a complete joke. They are clearly making a grab for money before data allowances disapear like Asia and the States. Sick of this. I left Aldi Mobile for Yatango because they shifted the goalposts and started charging us more. One month later and Yatango are up to the same tricks. No viable competition in Australia to prevent the big carriers rotting us. I did exactly the same…….now where do we go….? What about amaysim? I tried yatango, but moved to amaysim recently. If you need referral code (gets you $10), leave a reply. I want 4G, I want more coverage, I want faster speeds, I want more data…but you can be damned if I’m going to pay any more for it!